The New York Times recently published concerns over Venezuela’s entry to Mercosur, Latin America's largest trade bloc. Mercosur purportedly “sets a terrible example for the region” by allowing in a country with “precarious protection of democratic rights,” according to those quoted by the Times. In contrast, the newspaper uses no space in its article to explain the background behind the antidemocratic ouster of Paraguay's president, Fernando Lugo, a reason behind Mercosur's inclusion of Venezuela. 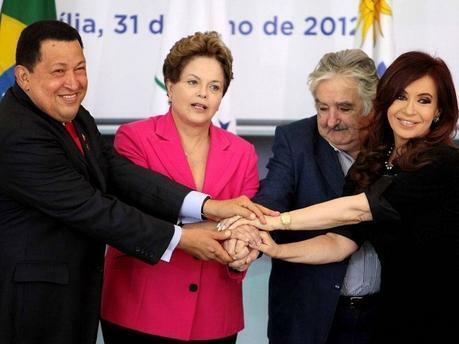 On Tuesday, July 31, the presidents of Argentina, Brazil, and Uruguay met in Brasília and formally admitted Venezuela into Mercosur, the world’s third-largest trading bloc. Venezuela’s full membership, the BBC reported, had been previously approved by all of Mercosur’s member countries except Paraguay, whose rightwing congress had obstructed the initiative for years. With Mercosur’s recent suspension of Paraguay over a parliamentary coup carried out in June, which saw Paraguay’s President Fernando Lugo overthrown, the $3 trillion trade grouping easily voted Venezuela in. Simon Romero, however, writing for The New York Times, portrayed Venezuela’s entry as a cause for concern. In fact, he provided the final word of his piece to a political scientist who believes Venezuela’s admittance “sets a terrible example for the region” and “reveals Mercosur’s political weakness.” Romero is not alone in underlining the supposedly troubling aspects of this unprecedented step toward regional integration—The Economist called the move “cunning,” and Businessweek began its article on the subject by contending that “Hugo Chavez’s back-door entry” somehow “casts doubt on the future” of Mercosur. Romero gives such criticisms ample space; he even dedicates a paragraph to Chávez’s tardiness and deviation from protocol at Mercosur’s accession ceremony. In contrast, Romero does not once explain the background behind the antidemocratic ouster of Paraguay’s Lugo, which happens to be a principal reason behind Venezuela’s inclusion. Romero has previously demonstrated a tendency of downplaying the threat to democracy that Lugo’s unconstitutional removal poses. In his June 23 article on Lugo’s overthrow—misleadingly titled, “In Paraguay, Democracy’s All-Too-Speedy Trial”—he allowed Michael Shifter, president of the Washington, D.C.-based Inter-American Dialogue, to incorrectly state that Paraguay’s “Congress may have acted in accordance with the Constitution” when impeaching Lugo. Romero also quoted Paraguayan law professor Alberto Poletti, who ignored Lugo’s right to due process: “The process in which Lugo was removed may not have looked fair, but it was entirely legal,” he said. 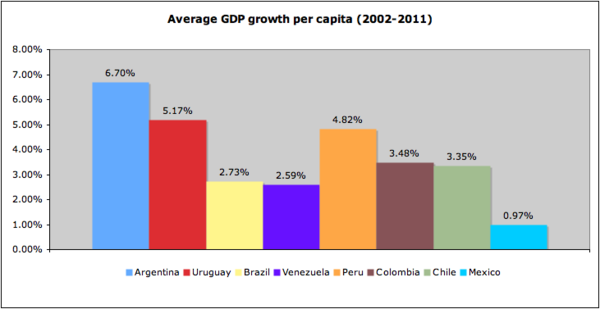 Lastly, in attempting to illustrate the fraught nature of Mercosur, Romero argues that the organization is “grappling” with “the rise of another regional bloc, the Pacific Alliance, whose four members—Chile, Colombia, Mexico and Peru—have enjoyed fast economic growth.” One may suspect that Romero’s description of a trade grouping made up of four historically conservative Latin American governments is too convenient. And it is. The International Monetary Fund’s statistics beg the question: How could anyone reasonably argue that Mexico has “enjoyed fast economic growth” when its per capita GDP has increased at under 1% for a decade?